Location of stimulated electrodes in the index patient. (A) Postimplantation lateral skull radiograph showing relative positions of the intracranial electrodes; red and blue volumes indicated by a black arrow highlight the contact pair yielding anxiolytic benefit. (B–D) Postimplantation MRI demonstrating positions of stimulated cingulate contacts; coronal slices in B and C correspond to the anode (red) and cathode (blue) of stimulation-eliciting anxiolysis and mirth. 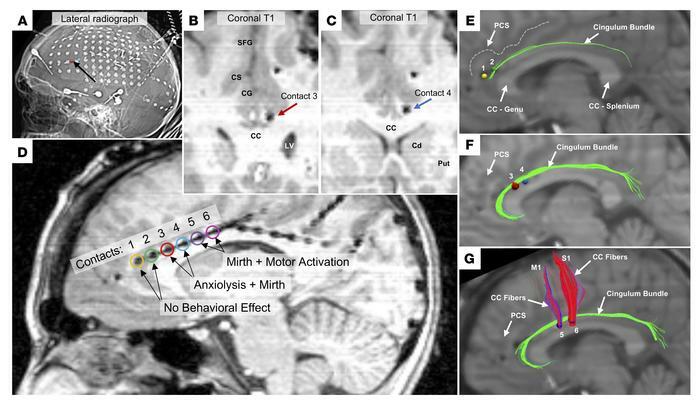 Cingulate gray matter stimulation utilized contacts 1–2 (yellow, green), cingulum bundle stimulation eliciting anxiolysis and mirth utilized contacts 3–4 (red, blue), cingulum bundle stimulation eliciting mirth and motor activation utilized contacts 5–6 (purple, magenta). The recording site for single-channel and coherence electrophysiological analyses was contact 5 (purple). (E–G) Sagittal views of deterministic tractography seeded at all tested contact pairs using modeled bipolar volumes of tissue activated via artificial neural nets based on 1.5 mA, 130 Hz, 300-μs pulse width stimulation. (E) Contacts 1 (anode; yellow) and 2 (cathode; green). (F) Contacts 3 (anode; red) and 4 (cathode; blue). (G) Contacts 5 (anode; purple) and 6 (cathode; pink). SFG, superior frontal gyrus; PCS, paracingulate sulcus, CG, cingulate gyrus; CC, corpus callosum; LV, lateral ventricle; Cd, caudate; Put, putamen; M1, primary motor cortex; S1, primary sensory cortex.